The Social hub combines you email accounts with social networking (Facebook, Twitter, LinkedIn) shows all incoming messages as one list and your social feeds as another. You also get handy shortcuts to reply, mark as favorite and so on. Thanks to the two-column interface you can easily switch between your accounts, messages and feeds if you don't need all the stuff in one place. 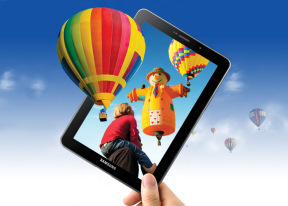 The Samsung Galaxy Tab 7.7 comes with a GPS receiver, which got a satellite lock in under two minutes with A-GPS turned off. A-GPS can speed this up quite a bit, but requires Internet access. We gotta say, we didn't experience any issues with the GPS performance. With a screen as large (or larger) than most dedicated SatNav units, with excellent sunlight legibility and plenty of storage, any money spent towards satellite navigation should go to buying a good app rather than a separate SatNav unit. The Galaxy Tab 7.7 comes with Google Maps and Navigation. Voice-guided navigation has become a viable solution since the v5.0 update. Vector maps are smaller and way easier on your data plan and 3rd party SatNav apps are in danger. With a 1.4GHz dual-core CPU and powerful graphics chip, the Samsung Galaxy Tab 7.7 can run every Android app designed for phones and slates. The Android market has been recently rebadged as Google Play. It is the fastest growing app repository around (also the one with the most free apps and number of downloads), so you can be sure that you won't be having a shortage of software to install on your Galaxy Tab 7.7. True, some apps aren't designed to work on a WXGA screen, but most scale well, so the only thing you have to worry about is finding enough time to enjoy all those apps. The new design makes it easier for you to find the quality apps. There are featured apps, editors' picks and staff-recommended apps in addition to the usual top free and top paid. And if by some reason, the soon-to-become number 1 app repository on the market isn't enough for you, you might want to check out some of the alternatives. Amazon has set up its own appstore and so has Opera, plus a few more minor app stores here and there. Choice is one of the best parts of the open platform. Samsung's own store called SamsungApps is also on board. There you can get a lot of free apps for your tablet.